Before you jump into seeing the photos or watching the video I want to remind you that there's no right or wrong way to approach bringing all this together into an album. Tell the stories that matter to you in a way that's enjoyable to you. That might mean you use a ton more product or a lot more handwriting or a lot less photos or no words right on your photos and a whole lot more pattern paper. Take my ideas as a jumping off point but make the process work for you and your family and what makes you happy. What is the story I want to tell? How do I want to communicate that? Let the story take the lead. Choose photos. 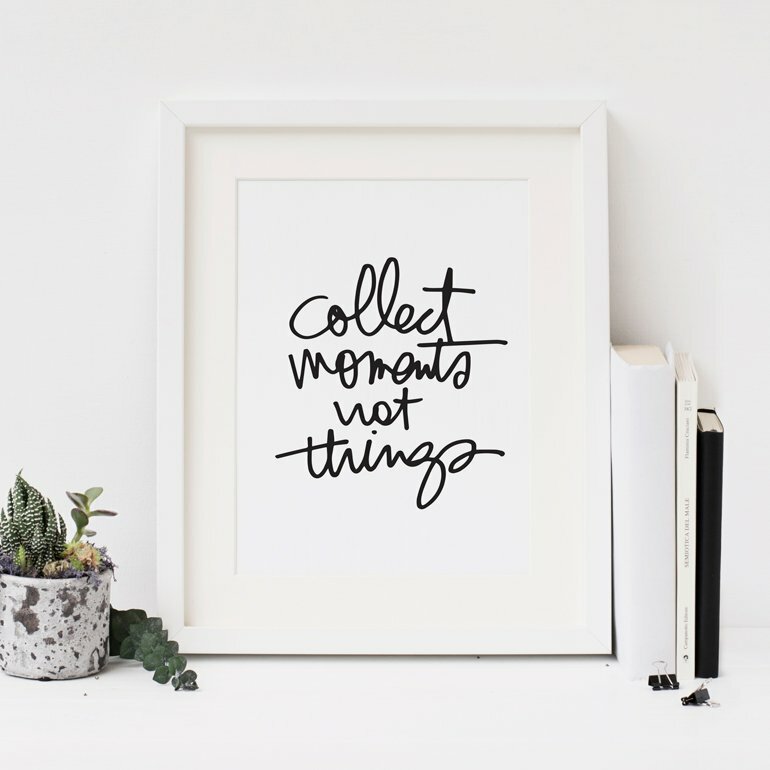 For me this includes looking back at my blog posts for the week. I figured that I put effort into those posts (choosing photos + writing words) so why not use that as the jumping off point for my album. I'm doing it one day at a time because each day had it's own feel and I like focusing on one day at a time. Resize photos in Photoshop and add words directly to the photos using the Type tool. Again, my words are coming directly from my blog posts with a few additions here and there. Print photos. I print at home using either an Epson PictureMate Show for 4x6 and smaller or an Epson R2000 for enlargements. Add embellishments. This includes stamping on the photos. Getting one day done really helped solidify my process for the rest of the days and I think it will go quicker as I move forward. I'll continue the pattern of dealing with the photos and the words first and then add embellishments. Most of the products I'm using came with the Week In The Life™ kit. I've added a supply list at the bottom of this post for any additional things I used. If you are following along with my design plan for 2014 and using the album/kit option you should have one or two extra page protectors. I decided to start my album with one of the 3x4 pocket pages that I cut in half (making sure to maintain the pockets by cutting on the outside of the seam) because I like to vary the size of the page protectors I include in my album. Adding this pocket page gave me the chance to introduce this album and include "my reason why" and "who we are right now." TOP POCKET | Week In The Life™ patch adhered to the star transparency. WOOD VENEER DAYS OF THE WEEK | Along the edge of the pockets I adhered the wood veneer days of the week using 1/8 inch red line tape. You can paint this or emboss it or cut it up or just leave it plain and attach or adhere. I decided to simply adhere it along the edge of the cut page protector. Whenever I include a cut page protector (or another insert that is smaller) I like to add something to the edge. The red line tape seems to be holding it in place just fine and it's totally transparent from the other side. BOTTOM POCKET | Begin with your "reason why." I took one of the cards from the kit and stapled the "my reason why" (you can find this on the perforated phrase/word sheet) on top of the other word that was there originally. For the title of the card I stamped and embossed (with the Gold Glitter Zing) "stories of life" which is part of the stamp set that came with the kit. To print directly onto a journal card I simply set up a 3x4 inch canvas in Photoshop, measure the space I have for my text, and then print a test print on regular printer paper. After that I temporarily adhere the actual journal card onto the printer paper and run the card through the printer again - out comes the journal card with my words right where I want them on the card. Behind the Week In The Life™ patch I used the circle stamp + the "this is our life" stamp from the kit + Gold Glitter Zing. A 1.5 inch circle punch is just the right size for that stamp. MAKE A "WHO YOU/WE ARE" CARD | Another thing I wanted to include at the beginning of the album (and part of the reason I added this title page) was a simple journal card that included our ages and just a few things we are each into right now. The big "E" is from this set of Pebbles Gold Foil Letter Stickers. I use them a couple more times on other photos this day. As you will see throughout Monday I'm using the perforated phrases/words on just about every photo (seen above under the "E"). I love those things. For my title photo I went with a full page 6x8 + digital word art from my What Today Looked Like set. I adhered the blue star above the title using some red line tape. In the video tutorial last week I walked you through the process of working with the Week In The Life™ Layered Templates. One of the things I mention in that video is the ability to remove (turn off the layer or erase it completely) to customize it to what you want. For Monday I decided to remove the lines - one click hid all the lines, another click hid the logo and the third click hid the year - and add some of my journaling right to this main page. All the journaling throughout this first day came directly from my blog post sharing my words and photos for Monday. On the perforated strips there are days 01 thorough 07 so I'm planning to add those to each day of the week on the first page. A simple and easy way to add more photos to your album is to adhere them back to back. I printed out these two photos, adhered them together with rolling adhesive and then used a Crop-A-Dile to punch holes that match the rings in the album. I do that by simply laying a page protector on top of the photos and using those holes as a guide. Next I cut the chipboard "AM" and added it right above the journaling. 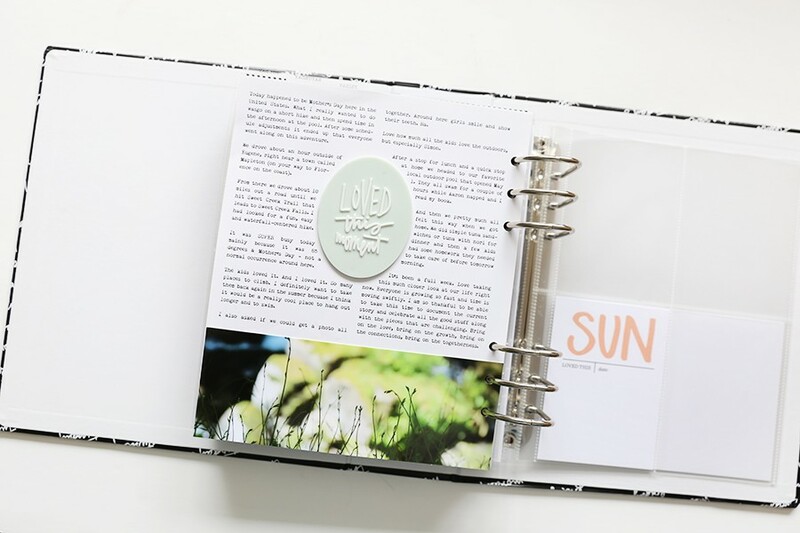 I really like the look of the printed journaling directly on the photos + a physical embellishment on top. I'll be repeating this simple concept throughout the album. In general I like to add photos chronologically, starting at the beginning of the day and moving throughout the day towards the evening. It's not a hard and fast rule for me though, as you'll see as I share the rest of Monday. You might choose to group yours in totally different ways - such as by time of day, theme, etc. Next up in my album is the 3x8 page protector. Which I love. Which I can't wait to have more of in the shop. I'm a big fan of inserting these kinds of pages in Project Life® (pages that are shorter widths than the rest) and was excited to include these in the album/kit option. Also included in the kit were these 3x8 timeline cards. For Monday I decided to print small photos and add them right onto the timeline card vs. journaling. It's likely that I will write or print on these on other days, but it's nice to show a different way of approaching them. On top of each photo I added 1/2 of a label along with a couple words about the photo itself. Cutting those labels in half will give me more options as I move forward with the week. The last thing I added to the 3x8 page protector was a small index tab (also included in the kit). Instead of using what's printed on there I stamped on the inside using ">> stories" ("remember" would also fit) in red ink. I stapled that in place using the Tiny Attacher. On the back I went for a full page 3x8 photo. I cropped this image in Photoshop (3x8 at 300dpi), added the text and then printed it here at home. I might not do this same thing each day because this is a great space to be able to add more words, but it works awesome for when you have a lot of photos. We'll see as I tackle the other days what makes the most sense for each individual day. I cropped my photo in Photoshop and then printed on 8.5x11 photo paper and cut it out. For future days I'll likely do two 3x8 photos on one 8.5x11 inch piece of photo paper just to save some paper. Next up is a 4-3x4 pocket page. I'm including a chipboard number for each day of the week and using the Gold Glitter Zing on the front and back before stapling them into a pocket. I love keeping some things see-through. On the photo of Anna in the bottom left pocket I stamped "love this" from my Photos Stamp Set and added "be fearless" from this awesome Tim Holtz rub on sheet. To stamp on the photo I used Black Cherry StazOn ink. On the To-Do list journal card I just added a few simple things I knew were on my list that day. On the back side of the 4-3x4 page protector I included the "Monday" card and two more photos. I stamped "this is my life" from the kit stamp set using Black Cherry StazOn ink on the top photo. As I looked through my photos from Monday there were two more that I really wanted to enlarge. They didn't fit into my original design plan (hello, be flexible) so I simply enlarged them using the actual size of the page protectors as a starting point (so larger than 6x8) and decided to make the width just a bit smaller. The images ended up being 5 inches wide x 8.25 inches tall. I printed both out, adhered them back to back and used the Crop-A-Dile again to punch the holes. I did take into account where the holes would be when I was placing my type on my photos. There have been many mini-albums where I've done this sort of thing in the past. I'm remembering how much I like to have some other kinds of pages mixed in with the page protectors (I'll be doing this same thing in December Daily® again next month). In addition to the journaling I added a gold letter sticker + a perforated phase to each photo. You'll notice that I also added a larger index tab + stamped "this photo has my heart" from my Photos Stamp Set. Photos + words people. Sigh. I just love it. Next up is a 2-4x6 pocket page protector. 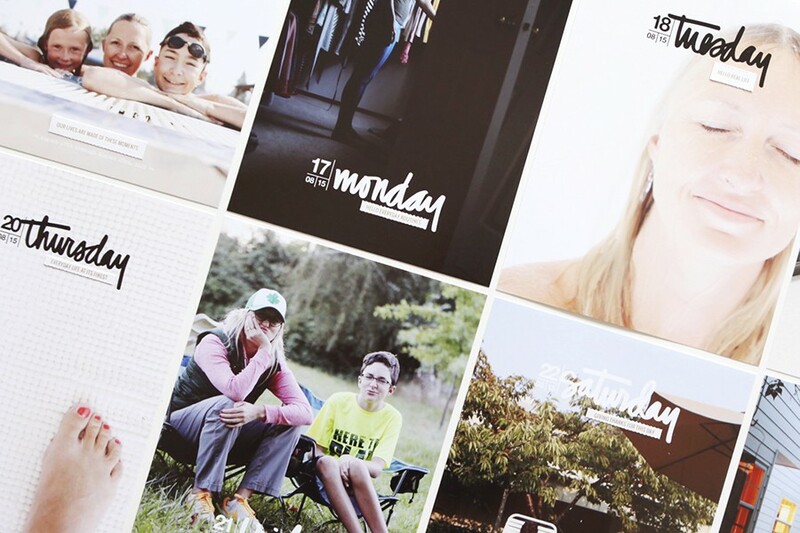 I went super simple and just added four 4x6 photos with journaling + the perforated phrases. In the coming days in this album I'll add more of the labels, the chipboard pieces (like I did for "AM" above), and the longer label stickers. Another thing I did a little different is rather than use one of the 6x8 Layered Templates for the last page of my Monday, I decided to do another full-page 6x8 and add a list of my gratitudes for the day. These came right off my Daily Sheet. It's likely that I'll use one of the photo collages on another day, but this felt right for Monday. I also love how this page turned out - being able to add both these images next to each other makes me really happy. It's such a standard routine in our house at bedtime - a treasured part of the day for all of us. "Filled with gratitude" comes from my Just Thankful Word Art set. One thing I didn't add, as you might notice, are the times of day. I usually add those in some way and to be honest, I forgot because I was simply copying and pasting my text from my blog posts. I will be adding my daily sheets in the pocket behind the last 6x8 photo so they can be accessed in the future. Remember, make this project work for you! Thanks again for playing along again this year! I'll share more from my album as I complete the additional days. Want to check out past Week In The Life™ posts? Check out my archives here. You can also see examples of past albums under the Week In The Life™ Projects Tab. This has helped so much Ali. Especially the intro to the album. Thank You. :) PS Love the little sheet of words. I have already used mine on every photo! Always love reading about your process. Have yet to create the album, but I'm excited to get started now! I think this is your best yet. I'm so darn inspired, but have to wait. Around noon we are going to get slammed with snow, and that's my go time. I agree with everything ^^^Cathy Z ^^^ up there said. Your photography? Outstanding. I think you need to teach a class on this. Oh wait, you already are and I'm in it. Everybody needs to take it. Everybody. LOVE your "reason why" and "about us" page! That opening photo of the three of you? Priceless! love love love it! Now I'm second guessing mine! I LOVE this!! This is my favorite size album, along with 8.5x11 and this just looks great. I really need to learn how to do the digital stuff. :) I love everything about this album! So inspiring. THe images are spectacular, but I just adore how story focused this is. But on the playful front, you have my mind spinning about how I can design peek-a-boo shortened pages in a finished photo book. I just love that opening look of the 6x8 peeking out from behind the 3x8 so very much. Ali, you are such an inspiration, as always. I love your creativity. Thanks for the motivation! I'm hoping this will finally be the year that I complete this project, but I see that the kit is no longer available with the album. Can you tell me the brand and if it is/will be available separately? Hi! The album was exclusive to the project this year. I will have similar albums for sale in my shop here towards the end of this year/early next year. Other companies sell similar 6x8 albums - you can check out Studio Calico or Scrapbook.com for other options. Ali, I can't tell you how much I love your new site and everything you do! I so look forward to coming to this space daily for a dose of inspiration. Yours is different from other sites out there that just sell products as you give complete instruction and inspiration on using those very products (most of the time for Free). The kits and the stamps have been very high quality. I am looking forward to seeing what the Story kit will offer. 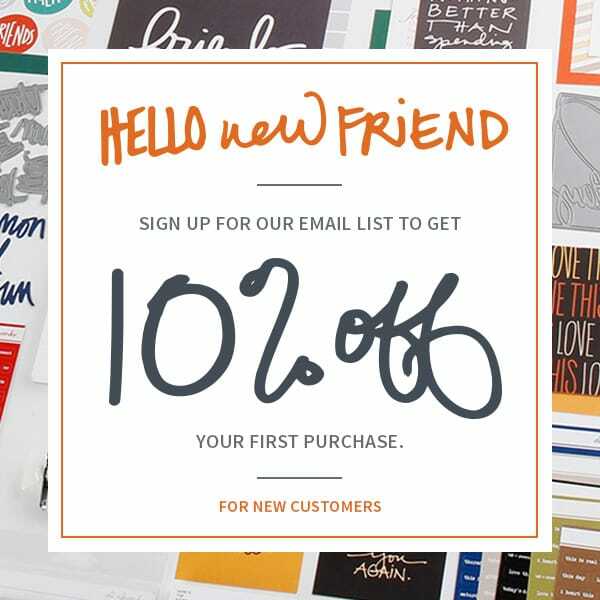 Yours is the site I go to exclusively now for all my scrapbooking products and classes and I have been scrapbooking for almost 20 years. Thank you, thank you, for everything you do! Beautiful! Love seeing the start of your album and getting ideas from it! Thanks for sharing! ali... do you mind sharing the font you are using for your text? Hi Ali... I have, what is possibly a stupid question that you have probably answered a 1000x... What type of white ink do you use when you are stamping directly on to your pictures?